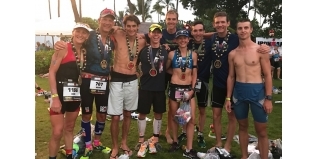 Ali'i Drive, Dig Me Beach, The Queen K, Lave Java - the sights, sounds (and even coffee shops) of Kailua-Kona, Hawaii, are the ultimate dream destination for many hundreds of thousands of triathletes around the world. I'm sure many (most?) of you, like us, spent most of Saturday and Sunday tracking the IRONMAN World Championship live on your computer screens perhaps with thoughts of, "one day, that will be me'. But... how do you qualify for the IRONMAN World Championship? That's the question we put to multiple Kona-qualifier himself and now triathlon coach, Russell Cox (www.coachcox.co.uk). As well as spending many years training to get to Kona himself, and several more coaching others to get there, Russell has probably also spent more time than anyone we can think of analysing the statistics of Ironman results and the qualifying process. In this first piece, Russell looks at the logistics of qualifying for Kona. In part two - coming soon - he will look more in depth about 'what it takes' to reach the standards required to earn your place on the Kona start line.